We spend a fair amount of time over on the coast. It’s within easy reach, and they’ve got all the birds, so you’ll find us there every couple of weeks. But to the Resident Expert it seemed that we were missing out on the good early morning and late evening times with our day-trip visit pattern. Sounds like a problem. How does one go about fixing that? You grab a day out of the space/time continuum to tack on to a regular weekend, and stay overnight. That gets you the edge hours and all that they offer. So that’s what we did. For our coast-side base, we selected Pacifica, or more precisely Rockaway, a small cove with beachfront hotels. It’s right there on Highway One. Looks like a nice place to all those hurtling south to Half Moon Bay or north to San Fran, but it’s taken us this long to stop and check it out. This is why have to take that extra day off – otherwise, you’ll never stop and look around. We checked in to the Holiday Inn Express, and were upgraded to a full ocean view room. Nice! 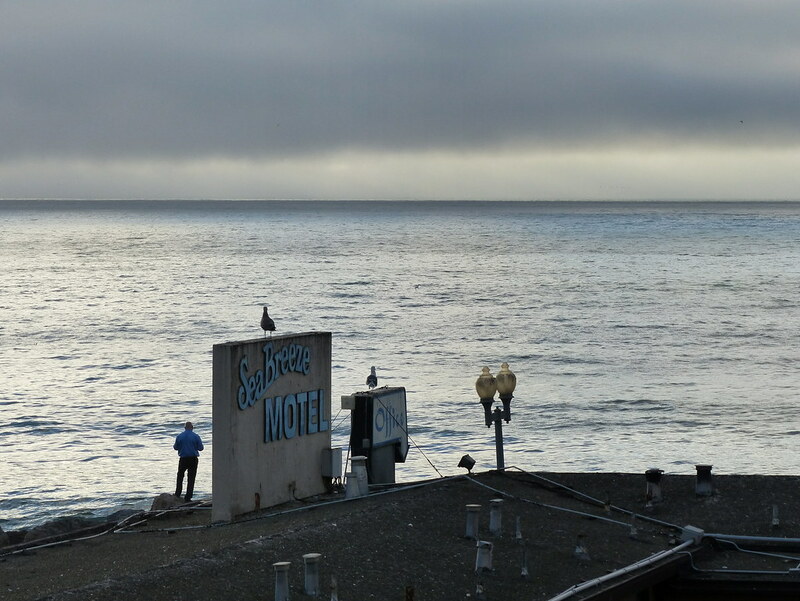 The full ocean view also included the parking lot for Nick’s Seashore Dining and the Seabreeze Motel, but that was fine. We could still see and hear the waves, and the many identical gulls. Here we are birding ‘Rear Window” style. Right after we checked in we strolled over the hill to view the scene at Pacifica’s main beach. The trailhead is right next to the hotel and leads you up some switchbacks that are adjacent to the highway. Is this fun? I wasn’t so sure. Let’s decide that later. Soon enough the trail leads you away from the road and down along the shore. 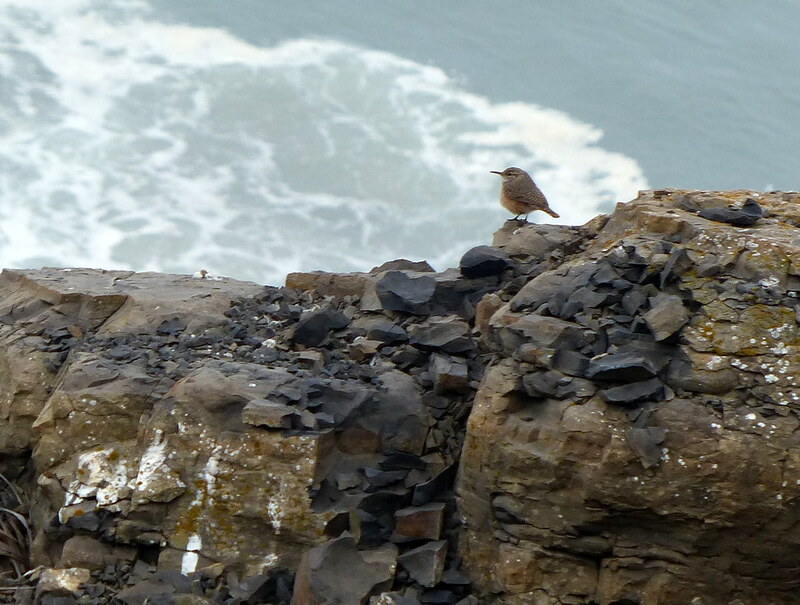 We took a side trail along the rocks to get a better look at the birds. Saw a Kestrel. And whales were visible, spouting and breaching further out to sea. Then a couple of dolphin cruised by. This is turning out to be fun after all. 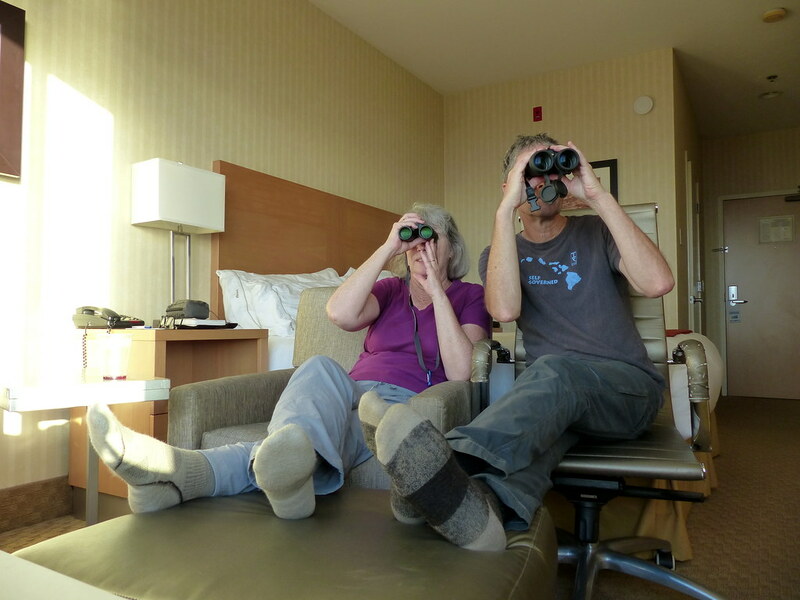 Back to our lodging, where we spent more time looking out the window with our binoculars. It was a beautiful warm day, but Pacifica’s legendary fog rolled in right at sunset. I don’t know who that guy is in the picture. We had dinner at Moonraker, which has quite the ocean view, except for the fog and it was nighttime. This apparently was a popular place in decades past, fell out of favor, and was recently resurrected, just in time for our arrival. After dinner we popped in to the lounge at Nick’s restaurant. The house band was skilled and personable. They’ve been playing there every weekend for over 15 years. Nick’s has been there since the late 1930’s. Why are we just finding out about all of this now? It’s that extra day off, I tell you. All of these places are a short stroll from the hotel, so you can just stagger around from place to place all evening if you so choose. And when morning rolls around, as it most certainly will, you can keep walking out to Mori Point, which is just north of Rockaway. We’d visited Mori briefly, once before, to see a whale carcass that had washed up on its beach. On that visit we could see there were more trails, and were most curious about exploring it further. No time like the present. There was a light mist as we ventured out, after enjoying our complimentary breakfast at the hotel. They had these miniature, identically formed “cute omelettes” (as the Resident Expert described them). Against my better judgment, I consumed one of them. Boy, do they have the White-crowned Sparrows over on the coast. I just learned this earlier in the year, but the coastside has its own subspecies of WCS’ that live there year-round. Around the bay, we just see them in the winter and spring, and then they move on to the mountains, or Canada, or Alaska. And at the same time, we have this other group of pretty much identical birds living a few miles away year round. Here’s where I would explain why this is the case, if I only knew why that was. Mori Point needs better trail controls. There are areas where people pretty much walk wherever they so choose, trampling everything in their path(s). This bothers me. After Mori we ventured down the coast, eventually reaching Point Año Nuevo. On previous visits I’d noticed a trailhead on the Cabrillo Highway, and rarely are there any cars. Where does it go? Let’s see. 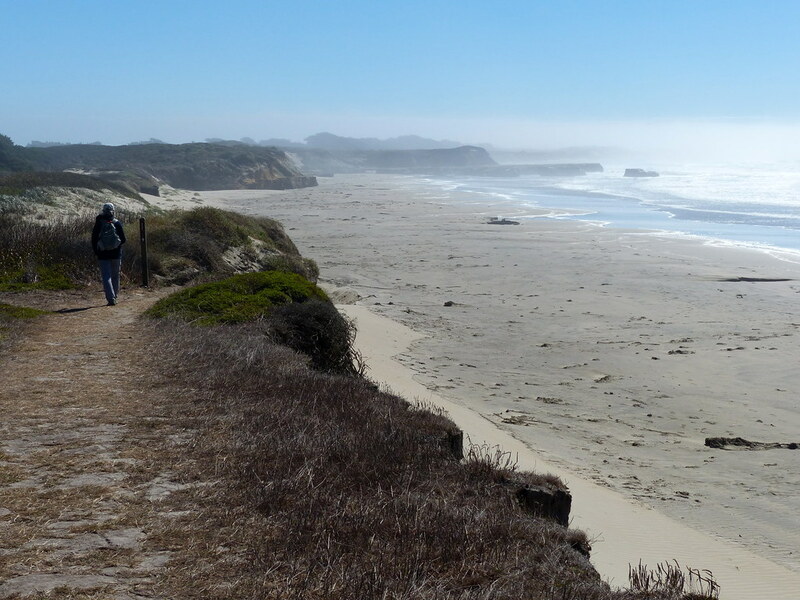 We cross a half mile or so of coastal prairie and come upon a windswept and isolated beach. I’ll just take a moment here to note that this is California, on a weekend, with beautiful weather, and there’s nobody here but us. How does it stay so secret? That half mile walk might have something to do with it. Now we’re on the move again, stopping at the Whale City Bakery in Davenport for well-earned cookies and lemonade. Then, back on the Highway One, heading north. Our next stop is Gazos Creek Road, near Pescadero. My bird research tells me it’s a good place to spot wayward migrant birds, and I am most keen to spot one of those. We wind our way back into the coastal hills and exit the vehicle to begin our walk. First big surprise: there’s water running in Gazos Creek. It’s a welcome sight and sound. It’s from the fog, don’t you know. The leaves of the trees snag their water supply from the fog and rain it down. “Foliar uptake” they call it. Here’s a look down at the little creek, from the road. 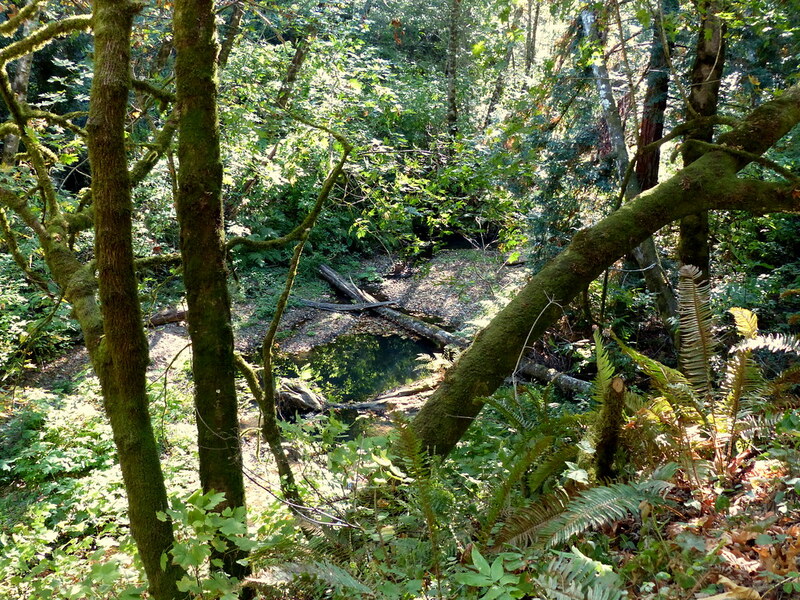 We’re not seeing tons of wayward migrants on Gazos Creek, but it’s a lovely walk. Super quiet back here. No cars, planes, people, nothing at all, just real real quiet, then – Crash! What the hell. I turn around, half expecting to see a black bear blasting out of the woods. We don’t have bears in the hills (yet), so it must have been a tree falling or something. We continue on, and the quiet returns. Now it seems a little too quiet. Maybe you’ve experienced this yourself, when out in the wild. Most of the time Nature is nice to look at and non-threatening. But every once in a while you get the sense that it could be very threatening indeed. The Resident Expert was sensing this as well, so it wasn’t just me. We had the feeling that something was watching us. We don’t have black bears, but we do have mountain lions, and Gazos Creek is one of their favored haunts. It’s getting to be late afternoon, and we’ve been walking for a while. “Want to head back?” “Sure, let’s head back.” We made good time getting back to the car. There was one more off-the-beaten track stop for the day. The local bird lore says that your best bet for owl sightings is on Higgins-Purisima Rd. at dusk. Look for them on power lines or snags near fields. We found a good spot for viewing right before sunset, and were treated to numerous other good birds busily wrapping up their day’s agenda. 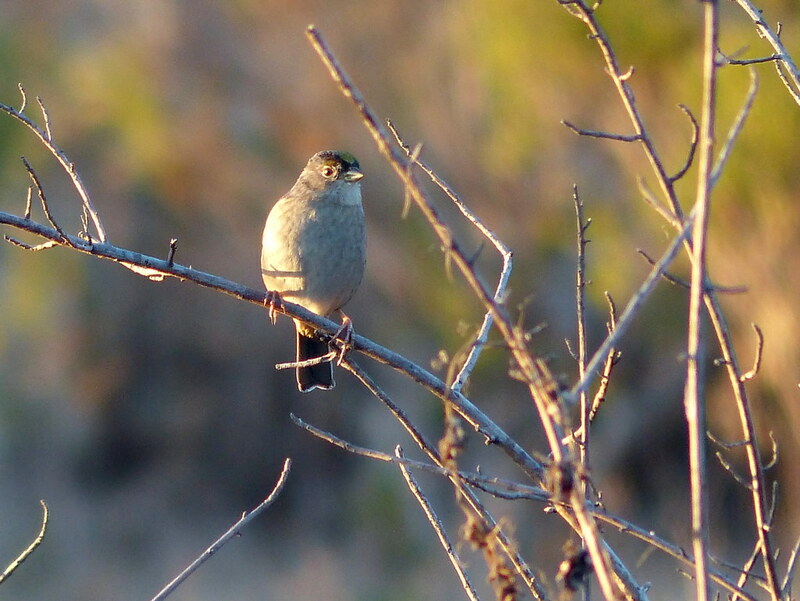 Here’s a Golden-crowned Sparrow for you. Right on cue, we heard the Great Horned Owl as the sun set. We didn’t see him, so we started driving up the road to spot the promised owls decorating power lines and trees along the way. Due to the sun going down, it quickly became hard to see anything. While trying to scan the power lines we almost plowed into a family of deer in the road. 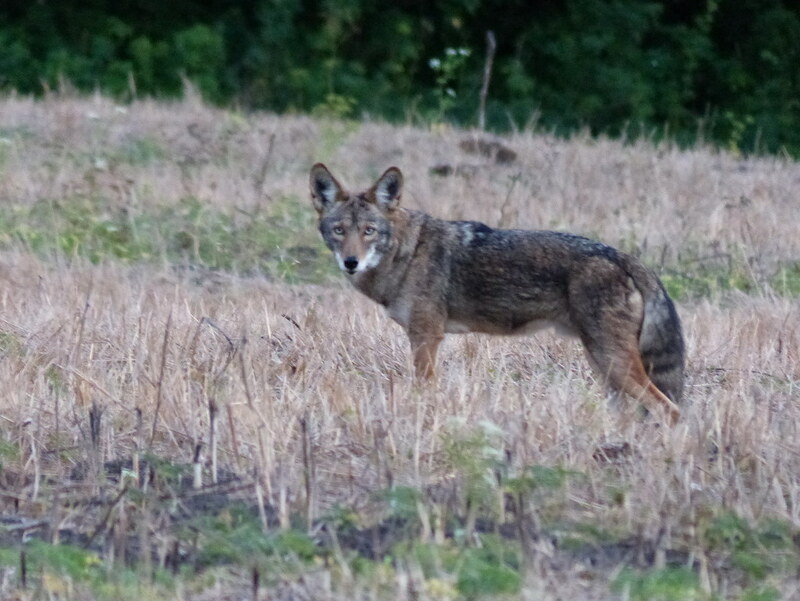 In the dusk, a lone coyote watched us, and we watched him. A bird flew across the road. Let’s say it was an owl and call it a night. We had a nice quiet dinner at Luigi’s in Pacifica, then turned in for the evening. Sunday morning we got our stuff together and made ready to head home. But not before having one more complimentary breakfast at the Holiday Inn Express. I steered clear of the Tiny Omelettes on this day. They have the Business Center right there in the breakfast area, and a fellow was pointing and clicking away right next to our table. I was ideally positioned to observe and report on his activities. He was scrolling through page after page of Lord of the Rings collectibles on eBay. Most of the items were commonplace, such as boxed sets of the DVDs. But there were some unusual items, like Lego Gimli figurines and small sculptures of the Nazgûl. And then he scrolled right by the One Ring. I was surprised to see it listed on eBay. One more stop before our quick drive home. We had not yet walked the Devil’s Slide trail, recently converted from the treacherous stretch of Highway One now bypassed by the tunnels. Inside birder info told me that you could see the Rock Wren here. That’s not a common bird in our area, and was discovered to be a resident here once the trail opened (it was probably here all along, although your only opportunity to see it is if your car went off the cliff). Sure enough, we saw the little bird right away. All birds have some fun and surprising thing that they’ve come up with to set themselves apart. Our Rock Wren is no exception. She makes a little “welcome mat” out of tiny stones, bones, and shell bits at the entrance to her rock home. They say the welcome mat can include up to 1500 pieces. Why does she do it? Nobody knows.